Blog – Tagged "Employee Bios"
We’re still truckin’ along with our Resolutions that we set at the beginning of the year here at Everything Summer Camp. Bringing these pieces of positivity into the springtime, folks around the office aren’t necessarily finding it easy, but are sticking to their intentions for improvement. Check out how we’re doing! Amy, who’s eating better, is still proud to say that she’s happy with her healthy habits. Folks around the office even vouch for her as they spot her with a salad for lunch every day. Way to go, Amy! Anita made her resolution to be more mindful of her overall health. She reported back that it’s been a tough month with temptations sitting right in her house. She’s hanging in there, though with a firm attitude for the future! You got this, Anita! Diane has been doing her best to help people out more. 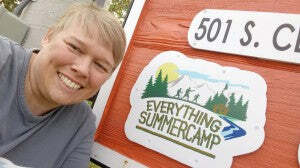 In March, she donated to a summer camp program that pays for kids to go to camp that otherwise couldn’t afford it. And she made purchases for the folks behind her in line at the store on two separate occasions. Awesome job, Diane! Matt is watching his weight. After a couple of very successful months, Matt confessed to gaining back several pounds in March. He isn’t, however, letting this discourage him from continuing to keep an eye on his weight. Keep it up, Matt! Morgan resolved to get straight A’s in her last semester of college. She’s still pulling it off! “Barely,” she noted, “But it’s still an A!” Maintain that A, Morgan! Nate is shooting for more ‘playtime’ with his kids and general family time. He’s had solid success too, taking advantage of snow days in the beginning of March and enjoying time outside by the end. Nate and his wife, Katie are teaching their kids simple lawn work and playing with them outside. Great stuff, Nate! For my own resolution, I strived to be less judgmental and have more patience. I still plan to be mindful of these qualities, however, I am bowing out of the Blog updates as I’ve let areas of my life get the best of me one too many times in the last couple months. I’d like to turn this negative thinking around as soon as I can. Resolutions are challenging and the year is long! We’re bound to be faced with rough patches along the way! Don’t let the setbacks keep you back! Everybody is still doing great (especially Bob who has remained just the way he likes himself—the same. Good job, Bob)! Keep up the good work with your own resolutions for 2019, Everyone and, as always, thanks for reading! Before we step any further into the month of March, it’s time to give the official Everything Summer Camp 2019 Resolutions update. Employees around the office here have set goals for themselves going into the year and I’m here to keep tabs on everybody. I hope all of you are doing as well as folks around our office are with your own resolutions! Amy resolved to reform her diet and start eating better. “Still doing ok on the healthy eating,” she informed me. She tacked on a confession saying, “Other than the two batches of cookies I made and ate a lot of.” Amy’s calling herself out here, but aside from this little slip, she certainly seems to be going strong! Keep up the good work, Amy! Anita made the resolution to increase her overall health with more exercise and kicking lousy habits. Anita happily reported that she’s been doing good overall. She’s been staying very busy and recently took a weeklong trip to Florida where her eating (and the weather) was fantastic! While it was hard to return, Anita’s excited to continue her healthy habits in the coming month! Diane set out this year to make the world better by helping people more. Throughout February, Diane has actually quadrupled her initial intent to do a random good deed every month. “I did four this month,” she told me! “I don't know if I really am making this world a better place but I know the four families I did the good deed for were very appreciative.” You’re doing great, Diane! Matt resolved to shed some pounds and lose weight in the coming year. He’s still feeling good about his condition. “Still down 20 lbs.,” he shared. “Still eating as much healthy food as I can.” That’s excellent news from Matt! Well done, Matt. Morgan, who resolved to get straight A’s in her last semester of college, responded to my checkup that, “Yes, so far so good! It’s still early in the semester and I only have 2 grades in, but all A’s! Off to a good start!” Wonderful work, Morgan! Nate has resolved to spend more time with his family and more ‘playtime’ with his kids. He sounds pleased with his family’s progress throughout this past month. He mentioned that he’s been playing with his boys a couple nights a week, typically with his wife and daughter nearby reading or playing along. They do card games and, all in all, have made a habit of being together more often. Sounds great, Nate! As for Myself, I resolved to be less judgmental toward people and to have more patience. After some changes I’ve made throughout February, I’ve been put to the test on reducing my judgements. I can’t say that I haven’t lost sight of my resolution at times, however, I’ve remained mindful about it and am still putting my best foot forward. March is really going to make or break me, I think! I think we’re all still looking really good. I’m very proud of us so far! Keep up the good work, everybody (except for Bob who hasn’t changed a bit yet)! Keep up the good work with your own resolutions for 2019 and, as always, thanks for reading, Everybody! Here we stand, one month into the new year. So, before we step any further into February, I wanted to give an update on how we’ve been doing with the resolutions we’ve set for ourselves here at Everything Summer Camp. I hope all of you are off to a wonderful start with any resolutions of your own! Here’s how folks around our office are doing with their resolutions: Amy resolved to reform her diet and start eating better. She told me that “Surprisingly I have been doing good and sticking to it. I just can’t keep any sweets in the house!” I can relate to that, for sure! But when it comes to junky food, out of sight—out of mind is a real thing. Keep surprising yourself till it’s not a surprise anymore, Amy! Anita resolved to increase her overall health with more exercise and kicking lousy habits. She was happy to report that she, “Started out great, doing the treadmill every morning for 20 minutes, then the second week of January, every morning and night for 20 to 30 minutes. Lost 4 pounds!” She also got hit with a cold in January, so she disappointed she couldn’t stick to her daily routine for a little bit, but I’m definitely calling January a win for Anita! Diane resolved to make the world better by helping people more. “I have kept my resolution to doing one good deed a month,” she said, but she actually hit it twice as hard! “While in Roatan I gave money to a local family to buy food. I also paid for a car behind us in a fast food drive-thru. It feels so good to do these random acts of kindness.” Awesome work, Diane! I’m sure she’s making people’s days with her generosity! Matt resolved to shed some pounds and lose weight in the coming year. When I asked how he was doing, he told me, “Good. I've lost 15 pounds—halfway to my goal. Eating right, balanced diet with a lot of fruits and vegetables. Drinking lots of water.” That’s how you do it—well done, Matthew! Nate has resolved to spend more time with his family and more ‘playtime’ with his kids. “My resolution is going okay,” he said. “I’ve been spending quite a bit of time with my boys.” However, he’d still like to see more nights devoted to the whole family. “We’ve had a couple of family game/movie nights, but not every week like we want to.” This sounds far from a fail to me! Keep up the good work, Nate! And I resolved to be less judgmental toward people to have more patience. I think I’ve done well in preventing myself from letting my thoughts spiral about other people. I would definitely have to give myself a pass through this first month. Unfortunately, our Vice President of Everything Summer Camp, Mark, is the first to bow out of his resolution which was to get better sleep. He’s already failed in January. Too many late work nights for that guy! He says he still has full intentions to continue better sleeping patterns for himself, so best of luck to him moving forward in the year! A good first checkup for our participators, I’m very proud of us so far—only one casualty. Straight A’s for everybody else (not just you, Morgan)! And Bob, who resolves each year not to change a bit, is still the same ol’ Bob! Keep up the good work with your own resolutions for 2019 and, as always, thanks for reading, Everybody! Ready to embark upon 2019, Everybody? A fresh new year for accomplishments, new discoveries, and new prospects! From everyone here at Everything Summer Camp, we hope your New Year’s Eve celebration gave a warm welcome to 2019 and that you’re off to a wonderful start! While there are no real set traditions for the “common” festivities that we typically partake in on New Year’s Day, aside from a football game and snacks throughout the day, one thing we all seem to try for is setting resolutions for ways we’d like to see ourselves grow. We all do at Everything Summer Camp—well, all of us except Bob, of course, who resolves each year not to change one bit (I guess it’s a resolution…technically). Amy is going to whip her diet into shape and start eating better. Anita first said something similar to Amy about eating better, but then changed hers to being healthier all around with more exercise and saying goodbye to lousy habits. Diane would like to do more to make the world better—whether it means being more reliable to family and friends, making donations to those who need more than she does, or any other way she can. Mark, our Vice President, would like to grant himself better sleep. He knows he doesn’t get enough and feels that he can improve in other departments of his life by tackling this particular part. Sleep’s pretty important—sounds smart to me! Matt was reluctant to give a resolution this year, but admitted that he would like to shed some pounds and lose weight in the coming year. Morgan wants straight A’s in her last semester of college! She almost did it previously but ended up scoring two B’s. She was close. We’re all rooting for her this year! Nate would like to set more time aside for his family and more ‘playtime’ in with his kids. Me—as for myself, I’m sort of recycling my resolution from 2018 since I feel like I still have room for improvement. I’m trying to be less judgmental toward people and having more patience. To give a couple examples, this means keeping my cool behind the wheel and not letting a long check-out line at the store ruin my mood. Now, I warned everybody that I’d be checking in on them on a monthly basis to see how well they’re all keeping up with their resolutions. There’s a reason we don’t call them Old Year Resolutions—it’s because a lot of people lose sight of the plan they’d set when the year felt fresh. Let’s see how long we make it into 2019! Good luck with any resolutions you’re planning for your new year and, as always, thanks for reading! Earlier this month, I introduced our readers to our year-round assistance in our Graphics Department, Mellina. Today, it’s my pleasure to tell you about our other helping hand whom we’re happy to have in our Graphics Department at the Everything Summer Camp print shop, Deb! Deb came onboard our team three summers ago and has continue d each year to prove her helpfulness in our printing production! Always in good spirits with a smile on her face, Deb’s not afraid to roll up her sleeves and help out with our production of personalized products such as Iron-On Clothing Name Labels or Clothing Stamps, her main area of expertise is in clothing itself! We stock an abundance of blank clothing which Deb transforms into camp clothing according to the orders we receive. Deb’s days typically begin with pulling the blank clothes she’ll need to complete the day’s orders and then she executes the actual production, applying prints to clothing by all sorts of different methods. Much of her work can be accomplished on a heat press, but her second home is in the embroidery room where she operates and oversees the production of our machines. Along with pillowcase and laundry bag printing—not to mention her assistance in our graphics production—Deb enjoys the variety of work that life in the print shop provides her. “I’m never strictly standing at the heat press for eight hours.” She smiled. Before working at Everything Summer Camp, she was employed at the fitness center chain, Curves. And before that, she stayed at home, raising her beautiful family of three children with her husband, Don. While her kids, Rebecca, Sara, and Jared, have not had the experience of summer camp, Deb and Don go on family camping trips about once a year which the whole family enjoys throughout the years. They’re planning a trip to Montana to visit Don’s niece as they’re a rather adventurous couple. They get out to make fun trips as much as they can; in fact, Deb and her husband met while planting trees in Bemidji, Minnesota. Enjoy the camp clothing and other personalized graphics products that may have very well come from Deb’s caring hands and, as always, thanks for reading!